Picking green beans a little past their slender prime this morning, I had to give a wide berth to a humungous spider. Humunguous enough to see greenish-yellow stripes on its underside, and fine hairs on its long legs. A small yellow jacket got too close and landed in the web. The spider was on it in a flash, throwing out silk and rapidly rolling its helpless prey. Done. The yellow jacket wiggled a little in its spidery straitjacket. Then the webmaster approached and bit, letting out venom to paralyze the prey. Spiders, it seems, grow more common at the end of season. I should be grateful for their help in keeping down the insect population. In looking to understand what I saw, I read that spiders are nature's physicists in how accurately they construct their webs. 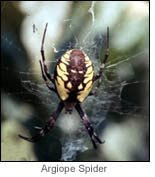 This science major was an argiope (rhymes with calliope) spider.